CME: This issue includes 4 AMA PRA Category 1 CreditsTM, 4 ACEP Category I credits, 4 AAP Prescribed credits, and 4 AOA Category 2A or 2B credits. Other Specialty CME Credits: Included as part of the 4 hours, this CME activity is eligible for 4 hours of Pediatric Nonaccidental Trauma credit, subject to your state and institutional requirements; 4 hours of Ethics credit, subject to your state and institutional requirements; and 4 hours of Trauma credit, subject to your state and institutional requirements. Emergency clinicians are likely to encounter physical abuse in children, and they must be prepared to recognize its many manifestations and take swift action. 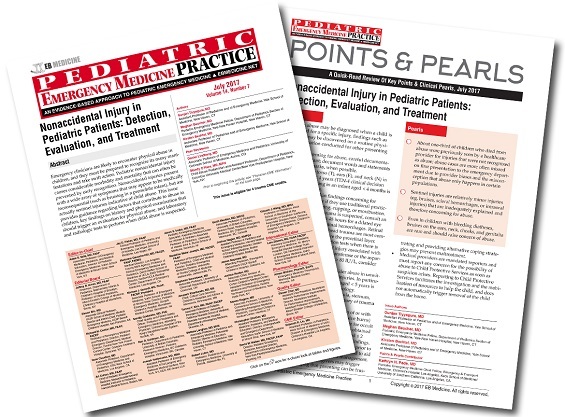 Pediatric nonaccidental injury causes considerable morbidity and mortality that can often be prevented by early recognition. Nonaccidental injuries present with a wide array of symptoms that may appear to be medically inconsequential (such as bruising in a premobile infant), but are actually sentinel injuries indicative of child abuse. 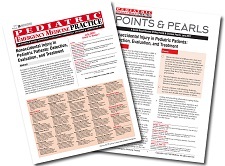 This issue provides guidance regarding factors that contribute to abuse in children, key findings on history and physical examination that should trigger an evaluation for physical abuse, and laboratory and radiologic tests to perform when child abuse is suspected. A mother brings her 3-month-old boy to the ED for vomiting and irritability. She says that the boy's father told her the baby wouldn’t stop crying and had vomited several times. The mother states the baby had been fine when she left for work that morning. The patient’s medical history is significant for colic and an episode of blood from his mouth 1 month ago. On physical examination, the baby is irritable, his anterior fontanelle is full, and his pupils react bilaterally. The patient continues to vomit several times in the ED and remains irritable and afebrile. You are worried that the vomiting and irritability are signs of abusive head trauma and you consider how to approach brain imaging in this patient. You then wonder whether you should order laboratory tests and assess for other occult injuries with a skeletal survey. Would an ophthalmological examination be indicated in this patient? Finally, you consider how and when to approach the family about a child protective services referral. A 2-month-old boy was transported to the ED by EMS. A neighbor had called 911 because of concerns of domestic violence between the parents. The mother denies domestic violence and says that the baby seems to be having some difficulty breathing. On physical examination, the patient is fussy but consolable. He is afebrile, but is breathing rapidly, with a respiratory rate of 70 breaths/min. There are bruises on his anterior and posterior torso and crepitus of his chest wall. When asked how the patient may have sustained the bruises, the mother states the baby may have “rolled” and hit the edge of the crib. You are concerned about physical abuse as a cause of your patient’s presentation. You wonder if domestic violence between caregivers is a risk factor for physical abuse in children. Should the developmentally implausible history provided by the mother make you more worried about abuse? You start to consider which laboratory, imaging tests, and consultations you should pursue to evaluate both for possible physical abuse and to exclude other diagnoses, such as a bleeding disorder. I now have increased awareness of diagnostic tools for evaluation of suspected abuse. I will now have more thorough exams in premobile infants with trauma and will do retinal exams on new onset seizures in infants. This article helped me be more aware to think of abuse.